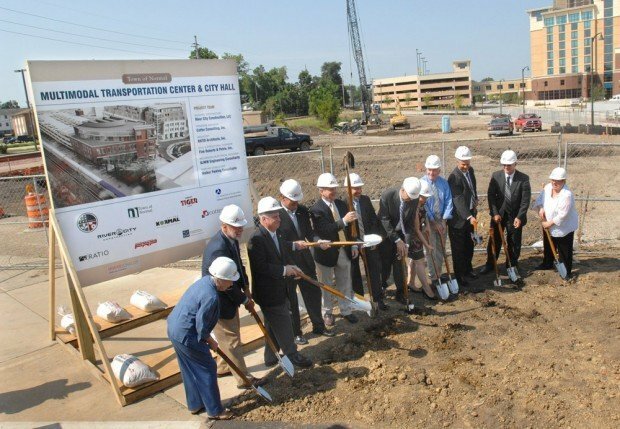 Local, state and federal officials touted the economic benefits of the uptown transportation center before turning the first ceremonial shovel of dirt near the site Saturday. Normal Mayor Chris Koos said construction of the transportation center, on the south side of Beaufort Street west of the Children’s Discovery Museum, will bring more than 300 “good-paying jobs” to the community. Ronn Morehead, president of Bloomington-Normal Trades & Labor Assembly, said that is particularly positive at a time when 40 percent to 55 percent of laborers have lost their jobs because of the recession. Morehead said 70 to 85 percent of a construction worker’s pay is spent in his own community. Besides construction workers, Durbin said more than 300 people will be put to work building 130 railroad cars for Amtrak, for the first time in 25 years. Morehead said he is hopeful some of the cars may be built in Aurora and Southern Illinois. U.S. Rep. Debbie Halvorson, D-Crete, said the center also will bring more visitors to the community who will shop at local businesses. “Stations are one of my great interests and as a former mayor I know they are engines of economic development,” said Amtrak Board Chairman Thomas Carper, former mayor of Macomb. Carper said studies show 81 percent of families and individuals want to live near transit access. The center, which will serve Amtrak, city buses, intrastate buses and taxis, will begin accommodating passengers in about two years. Uptown Development Director Wayne Aldrich said recent test pilings for the foundation went well and work on the actual piles will begin Monday. By the end of the year, Aldrich said, passers-by will see a steel structure. The center is expected to be complete by March 2012 with move-in by June 2012, Aldrich said. 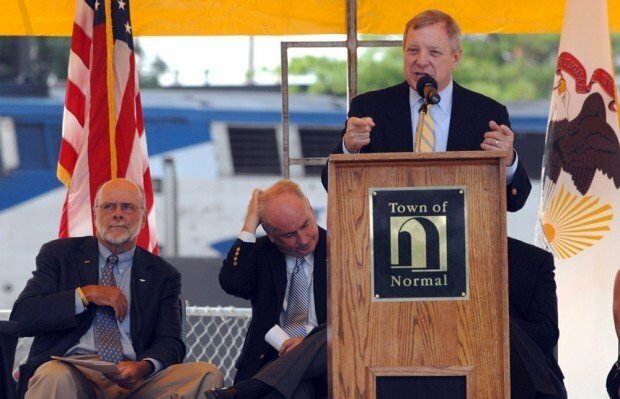 Koos said it was almost 10 years ago when then-Mayor Kent Karraker and City Manager Mark Peterson sat down with Durbin to float the idea of federal funding for the center. Koos thanked all the current and past federal and state representatives for their continued support of the project. Halvorson joined in 2008 and has been a “tenacious supporter,” Koos said. Federal Transit Administration Administrator Peter Rogoff said it says a lot that the project received $22 million in a Transportation Investments Generating Economic Recovery grant. Rogoff said the Normal project rose to the top because it embodied President Barack Obama’s vision for economic recovery by putting people to work; had such advocates at Durbin and Halvorson; and was ready to go. Building a high-speed rail corridor is costly, no doubt, but it's also beneficial. More than 300 jobs will be created in the first place and after completion, the entire community will see how much this project will help. Since we depend so much on transportation, the services on http://www.landstar.com/ are well known among those who need the best transportation solutions for their business. To succeed, we must choose wisely!